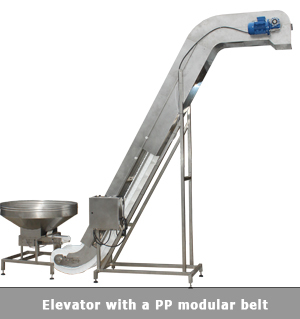 This type of conveyors is used for the transportation of dust-free and fragile products, such as chips, snacks, pellets, nuts, biscuits, sweets, mini-croissants, mini-waffles, etc... These elevators are also very appropriate for work with sticky or frozen products, such as dried fruit, frozen vegetables and fruit, jellies, blanched fries, etc. 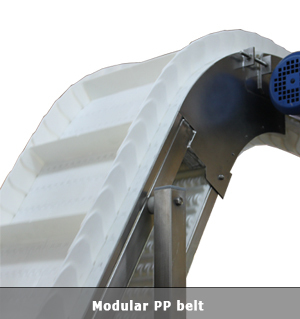 The product is loaded to the intake bunker of the conveyors, where via a belt or vibration is fed to the transporting flights of the modular belt, which move the product to the set working height. Depending on the customer's requirements and the specifics of the product, the belt is offered in a variety of dimensions and heights of the transporting flights. 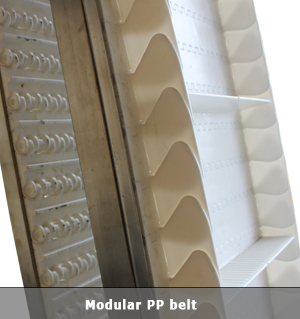 Unlike the PVC and PU belts, the modular PP belt is much more resistant to wearing-out and the effects of different oils. The elevators are manufactured from stainless steel and meet all the safety requirements for working with food products.